BULAWAYO, Zimbabwe, Dec 14 2015 (IPS) - In one Ugandan dialect, ‘kiwotoka’, describes the steamed look of banana plants affected by the Banana Xanthomonas Wilt (BXW) – a virulent disease that is pushing African farmers out of business and into poverty. A bacterial pathogen affecting all types of bananas including sweet banana (Cavendish type) and plantain bananas, a staple for more than 400 million people in developing countries, BXW is so destructive that there is a 100 per cent crop loss where it strikes. Smallholder farmers and the other actors in the banana value chain lose more than half a billion dollars in harvests and potential trade income across East and Central Africa. Signs of the disease first identified in Ethiopia more that 40 years ago, include wilting and yellowing of leaves with plants producing yellowish bacterial ooze, premature ripening of the bunch and rotting of the fruit. Currently, there is no cure for BXW. It is spread by insects or using infected tools and has been controlled through a combination of methods. Farmers have been taught to remove and destroy affected plants, taking out the male bud which is the first point of attack by BXW, using sterilized farm tools and destroying single infected stems. But the disease has forced many smallholder farmers in Africa to abandon growing bananas, which hold the potential to improve food nutrition and income security. This is in line with the new Sustainable Development Goals (SDGs) agreed to by more than 160 global leaders in September 2015. For farmer Lubega Ben from the Kayunga district in Uganda, a cure is long overdue. Each banana plant claimed by BXW on his 15-acre plot is one too many. Growing bananas for the past 40 years has helped Ben provide food and income for his family. Ben is convinced the 200 banana bunches he harvests each year could be more with better methods if the banana bacterial wilt is controlled. In addition to the package of efforts to control the disease, in 2007 researchers turned to science for a cure. Scientists at the International Institute of Tropical Agriculture (IITA) headquartered in Ibadan, Nigeria in partnership with the National Agriculture Research Organisation (NARO) in Uganda are close to a breakthrough after more than eight years researching solutions to BXW. In 2007, IITA and NARO, together with the African Agricultural Technology Foundation (AATF) and Taiwan-based Academia Sinica successfully engineered resistance of the African banana to BXW using genes from green pepper in the laboratory. Green pepper contains what researchers call ‘novel plant proteins’ that give crops enhanced resistance against deadly pathogens. The genetically modified (GM) banana varieties with resistance to the banana bacterial wilt disease were developed using genetic engineering. Genetic modification refers to techniques used to manipulate the genetic composition of an organism by adding specific useful genes. These useful genes could make crops high-yielding, flood, drought or disease resistant – key traits important for smallholder farmers in Africa who are experiencing weather variability linked to climate change. IITA biotechnologist, Leena Tripathi, has been part of the research team leading the fight against the Banana Xanthomonas Wilt. The transgenic varieties have undergone confined field trials in Uganda, a major grower and consumer of banana in Africa. The results are so encouraging that smallholder farmers in sub-Saharan Africa could soon be growing the new varieties commercially soon, says Tripathi. According to Tripathi, with the encouraging results so far, IITA and NARO are working on Matoke varieties which are preferred in Uganda and dessert varieties preferred in Kenya. “With a few more trials starting next year, then meeting the biosafety, environmental safety and satisfying regulatory processes, we hope by 2020 to get approvals and deregulation for commercialization and dissemination to farmers,” Tripathi said. Developing GM banana cultivars resistant to BXW is seen as economically viable because of the banana’s sterile character and long growth period which have been a challenge in developing a resistant banana through conventional breeding. “Genetic engineering is one of the most important crop breeding tools in the 21st century,” Daniel Otunge, Regional Coordinator of the Open Forum on Agricultural Biotechnology (OFAB) told IPS, adding that biotechnology has given breeders a faster, cleaner and certain way of producing crop varieties resilient to climate change, resistant to pests and diseases and that are nitrogen and salt-use efficient. “Africa should be celebrating these crops because they provide us with the best chance to be more food secure and nutritionally robust,” said Otunge. Researchers estimate that farmers will adopt GM bananas by up to 100 per cent once it is released, with an expected initial adoption rate of 21 to 70 per cent. The financial benefits could range from 20 million to 953 million dollars across target countries where the disease incidence and production losses are high, says research study, Ex-Ante Economic Impact Assessment of Genetically Modified Banana Resistant to Xanthomonas Wilt in the Great Lakes Region of Africa published in the PLOS ONE Journal in September 2015. 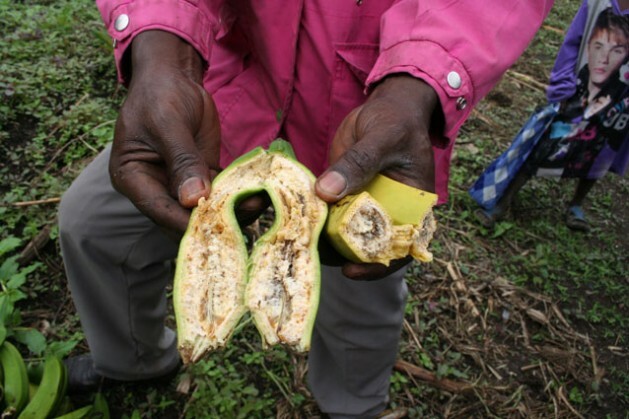 Concerned about the march of BXW, nine Uganda farmers got together in 2011 and formed a non-profit community-based organization, the Kashekuro Banana Innovation Platform (KABIP), to specifically control the pathogen on their plantations. More than 300 farmers in the Sheema District lost their plantations and 200 others were forced to replant or open new fields when BXW hit. They hope a solution lies in GM bananas. “Our farmers have not been exposed to GM bananas. Therefore, we need to try them and test whether they can be a solution,” says Anthlem Mugume, the coordinator of KABIP representing more than 2000 farmers, told IPS. Arguably one of the world’s favourite fruit, banana are the forth most important staple crop after maize, rice, wheat, and cassava with an annual world production estimated at 130 million tonnes, according to the African Agricultural Technology Foundation. Nearly one-third of this production comes from sub-Saharan Africa (SSA), where the crop provides more than 25 per cent of the food energy requirements for over 100 million people. East Africa produces and consumes the most bananas in Africa, with Uganda being the world’s second largest producer after India. According to the WorldTop Export, a website tracking major exports, banana exports by country totaled 11 billion dollars, a 32.8 per cent overall increase in 2014. A cleaner, healthier banana, offers Africa a sweet opportunity to break into the global export markets, reduce poverty and boost business for smallholder farmers.